Structured cabling simplified – no more hassles! Cabling is a crucial component of any kind of networking infrastructure. Moreover, a properly organized cabling indicates a healthy network. Simply put, cabling is the physical backbone upon which all other devices of your network are layered. 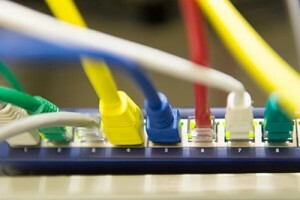 Poor cabling, as a result, can lead to spotty connectivity, packet loss, and unbearable internet speed. You Can Leave It All Up to Us! Noel Network & PC Services Inc. makes sure your office space is cabled in an organized manner from the get go. As such, all sorts of costly re-cabling works can be avoided. Apart from that, we also check line speeds in order to certify all the cables so you know your company’s network has been installed in just the right manner! Data, voice, and optical cable certification and installation can be cheaper than you think! Contact us to find out more. Take a few minutes and fill out the get in touch form provided on the right. Once you’ve submitted the form to us, one of our cabling experts will get in touch with you as soon as possible!